Zhejiang Wu: Chinese opera visiting D.C.
Last Friday, the Smithsonian Folklife festival (link) began in Washington, D.C. This yearly summer festival than takes place on the National Mall and highlights cultures from around the world. The two cultures highlighted this year are China and Kenya. 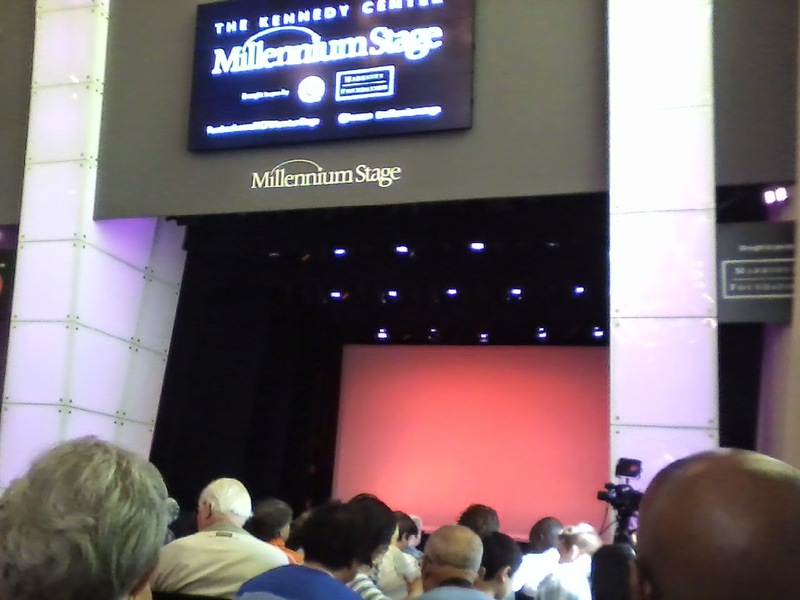 In conjunction with the festival, the Kennedy Center Millennium Stage (a program that features daily free shows at 6pm) put on a short, hour-long exhibition of the Zhejiang Wu Opera company, which had flown out from China especially for the Folklife festival. The Millennium stage series records all their concerts, and you can stream this concert for free here. Seriously, watch it. Chinese opera is different from Western opera in a few ways. First, there is not only scenery and spectacle and singing, but also acrobatics. Additionally, the action is more stylized than with Western opera, the singing style is very different (Western audience might think it very nasal, with varied vibrato, and lots of sliding ornamentation), and the action is accompanied by Chinese traditional instruments. Wu-style opera, featured here, is a little different than Peking-style opera, its more famous relative. The Dragon Dance - pretty amazing choreographed dance an acrobatic feat. If you watch nothing else, watch it this. A suona (bamboo flute) solo. Changing faces - Leaves you wondering "How did he do that!" and at the out-of-place Chinese-ish rock music accompaniment. Operatic scene: "The Legend of the White Snake" - a traditional scene, gives a great introduction to what Chinese opera is like. Huihu solo - an traditional Chinese string instrument. It's interesting to see how a huihu player can express more with their face than a violinist because the instrument is not tucked under a chin. Kung fu performance - while entertaining, I got the idea that this scene was made up recently for tourists, and doesn't have the cultural weight of the previous acts—though I have no grounds for this suspicion, as martial arts performers are an important part of Wu opera. The Folklife festival runs through July 6, if you are in the area. Have any of you seen a Chinese opera before? Each of the five branches of the U.S. military has a main band organization, and four of the main (or "premier") bands have their homes in the D.C. area. But these groups are not just the traditional concert or marching bands—they often encompass many other ensembles: choirs, a jazz bands, orchestras, rock groups, country music groups, or even a Celtic ensemble. Since the bands are paid for with public money, all of their concerts are free, and there are many of them. For example, over the summer on every weekday at 8pm there is some form of military music concert on the west steps of the Capitol building, a short walk from the Library of Congress where I work. So far, I've been able to see the Air Force band and the Army band (I tried to see the Marine band, but that concert got rained out; I'll have to see them and the Navy band later). I also went on a special tour of the Marine band complex and their music library, which may be the biggest performance library in the world. The Marine band has the special responsibility to provide music for anything the White House orders, and that means the Marine band has to be able to do anything at the drop of a (presidential) hat: chamber orchestra, marching band, sting quartet, various other chamber groups, or even a bluegrass ensemble. 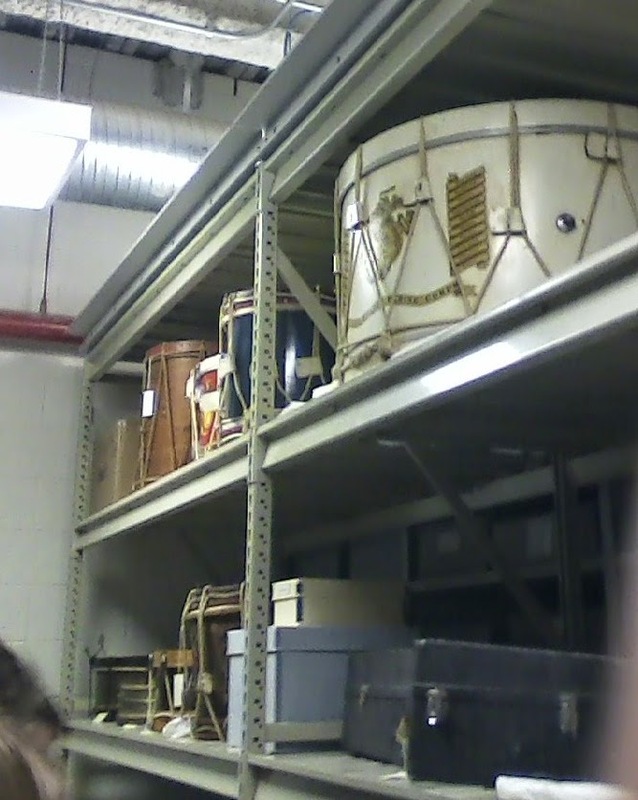 The Marine band library needs six librarians to keep track of all their music. 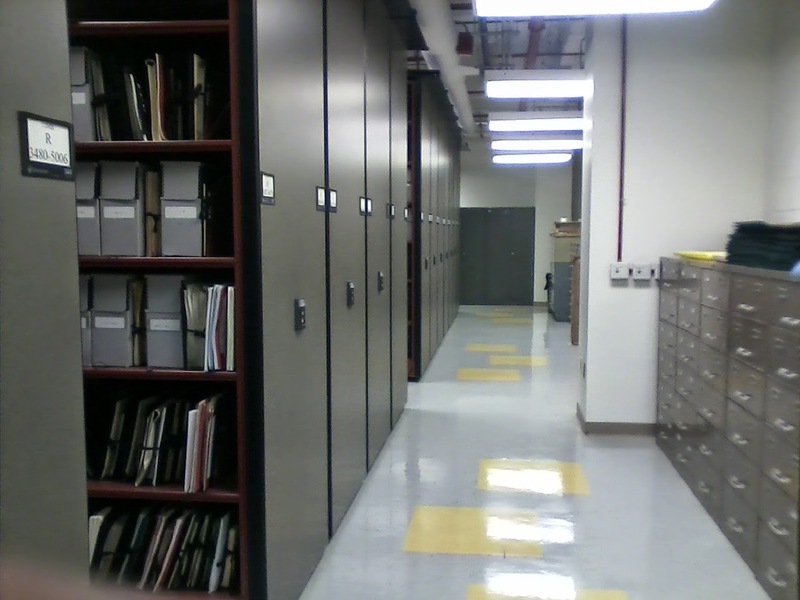 The library also serves as an archive for John Philip Sousa's personal papers, and even some historical instruments. Who plays in these military bands? If someone wants to be a professional classical musician, they quickly find out there aren't many openings for them. And the spots that do open up in the professional orchestras often do not pay very well. Professional wind players especially have a difficult time finding jobs The military bands, however, pay well with guaranteed retirement benefits (something being cut recently in major orchestras), and a member can retire after only 20 years. Like any major orchestra, a potential member does a blind audition, but unlike the orchestras, they have to go through basic combat training, too. But these groups aren't just for wind players—most of the bands have strings associated with them, and Air Force band has two cellos and two basses that actually play with the band. If you want to know more, the Army band records many of their concerts and makes them available on YouTube. The Marine band also tours around the United States. The Marine band records an album every year (they are recording this year's pretty soon), but it is hard to get the recordings, because the band can't sell them, just like they can't charge for their concerts. I had some friends who would go to military recruiting centers and sit through a presentation just to get the free music. If you are ever in the D.C. area, I suggest you should go and see one of these bands. 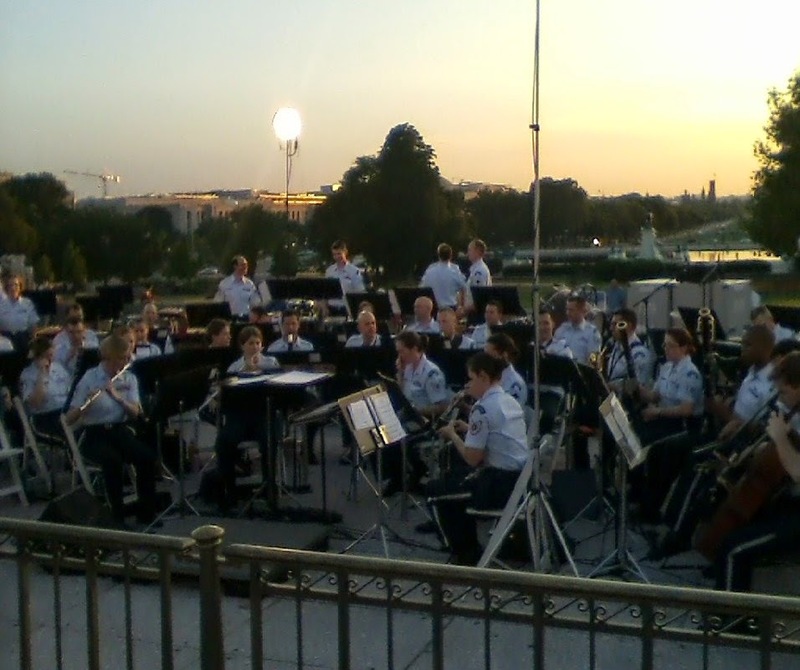 The US Air Force band at the Capitol. Notice the cello player on the right. Total Eclipse of the...Flowchart? Angel guy? Sometimes pop music can fill a weird space where we can celebrate and make fun of it at the same time. This is certainly true with Bonnie Tyler's smash hit "Total Eclipse of the Heart," which hit number one in several countries in 1983. And unlike some music from the 80s, it is still well-known today. A recent UK survey found it the #1 song people like to sing in the shower. And then there was the song's memorable placement in the 2001 movie Bandits, in which Cate Blancett's over-the-top character takes "Eclipse" as her theme song. I take no credit for this genius. As you can see from the flowchart, the song is a little repetitive, but that's nothing new for music. 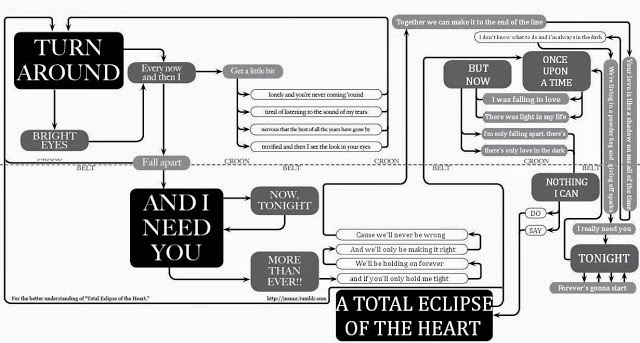 But what is a total eclipse of the heart? Wouldn't an eclipse of a heart mean that the protagonist would be devoid of feeling? Yet the singing and music is powerful and expansive, so the dramatic "eclipse" is assigned the opposite meaning—the power of the music fills the incongruous semantic void. In other words, the music take precedence over the lyrics. The words are just pregnant enough to act as cipher, a blank slate to which meaning can be attached (and "bright eyes"?). Like the song itself, the music video to "Total Eclipse" also makes no sense, but there was very little sense to work with. This is pretty evident in the "literal version" of the video, which I will leave you with. Enjoy! Summer Internship at the Library of Congress! As of today, I've completed 2 weeks of a 10 week internship at the Library of Congress in Washington, D.C. I'm working the music division providing bibliographic access, which is a fancy way of saying we take items and add metadata, so people can find the items. The old word for this was cataloging. The project I've been working on so far is the World War I sheet music collection, a large ongoing project we're trying to get ready for the 100th anniversary of the start of WWI, which happens this August. For the project, the library has been scanning and cataloging 14,000 of pieces of sheet music (about 100 archival boxes) from 1917-1920 for internet consumption. Most of the music came in as copyright deposits, since at the time people had to send in copies of everything they wanted copyrighted (no longer: see this post). During the very early part of the 20th century, sheet music was the main form of disseminating popular music. Since recording was not quite cheap and effective yet, amateur musicians would buy the music and play it on their pianos, with themselves or others singing the melody. Occasionally, a traveling vaudeville show might come through town featuring that year's popular tunes, but otherwise people had to reproduce the music on their own. During the American involvement in WWI (1917-1919), U.S. sheet music had an amazing topical focus on war, and all of this music that anyone copyrighted at the Library of Congress. Most of my work in music analysis has been analyzing just the exemplar or "best" music, but there's something to be said for looking at ALL the music produced in a genre at a time, even the mediocre ones, to see an overall picture. 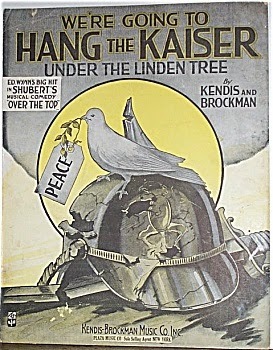 Such as just how many songs Americans wrote about about killing the Kaiser—it's really amazing. Besides written music, the Library of Congress also has recorded music and other items such as Gerry Mulligan's baritone saxophone, several Stradivariuses, and Fritz Kreisler's violin (a Guarneri). The strangest item: a parachute Danny Kaye used in a movie. This is part 3 of a 3-part series on the recently reunited Nickel Creek. You can read part 1 (the introduction) here, and part 2 (the context) here. In this post, I’ll briefly examine the first three Nickel Creek albums to show how they expanded and revitalized the genre of bluegrass. Their first album, eponymous album Nickel Creek, coincided with a new interest in bluegrass and “old-time” music sparked by the movie O Brother Where Art Thou? (1). It is still the group’s best selling album and was nominated for a best bluegrass album Grammy. Despite their popularity, or perhaps because of it, debate flourished about how “traditional” Nickel Creek’s sound was. Time magazine called their sound “something like Dueling Banjos as remixed by Fatboy Slim,” a description that challenges the bluegrass narrative of music from an older time (2). Nickel Creek's image certainly challenged the stereotype—their heavily-played music videos advertised young, attractive, and urban virtuosos. Despite Time’s exaggerated claim of the progressiveness, Nickel Creek did little to push the boundaries of bluegrass authenticity. The entire album is acoustic, with songs featuring three-part harmony, often in the choruses, with each of the three taking turns with the lead vocal. Tracks include a traditional instrumental (“Cuckoo’s Nest”) and a traditional ballad (“Sweet Afton”). The original songs on the album, often co-written by Nickel Creek and outside collaborators, follow standard country music forms (3). Yet, this first album hints at the new direction the group would take. Nickel Creek lacks a banjo, the instrument considered by some the most important indicator of bluegrass genre (4). Though their harmonic combinations are mostly traditional, their vocals lacked characteristic country twang. Similarly, they sped up and mixed progressive rhythms into the traditional ballad “The Fox.” At the climax of “The Lighthouse’s Tale,” they push the “lonesome sound” to the limit, overdubbing many voices for emotional effect. Also significant is Thile’s instrumental “House of Tom Bombadil”—though in many ways a traditional acoustic hard-driving bluegrass tune with four-bar phrases, large sections are in a hiccupping mixed meter, far from the normal duple-meter of traditional bluegrass. Also, the title is not a Southern reference, but a nod to the Lord of the Rings, yet a more literary than popular reference, as Bombadil does not appear in the movies. That the group was willing to have their music refer not to an older America, but a little-known rustic character from a fantasy world, shows an experimental, postmodern frame of mind. They declined to hide their urban, cultured personas behind cowboy hats. Nickel Creek’s second album, This Side, charted #1 in bluegrass albums (in the first year bluegrass charts existed), #2 in country albums, and #18 on the Billboard Hot 200. Even Krauss herself, who again produced this album, has not charted as high on the Hot 200 for a studio album (only # 29). This Side went on to win the 2003 Grammy award for Best Contemporary Folk Album. But why was This Side not considered for the bluegrass category as Nickel Creek was, though it was on the Billboard bluegrass charts? It seems that, to at least some people, Nickel Creek had stepped over the line of what was considered an “authentic” bluegrass sound. Soon after the release of This Side, bluegrass historian Stephanie Ledgin claimed of Nickel Creek: “With little, if any, resemblance to bluegrass, traditional or progressive, their original music connects with technical proficiency required in bluegrass with youthful, alternative acoustic blends of Beatle-flavored psychedelia, folk, pop, left-of-the-center rock, and other imaginative sounds” (5). Ledgin discounts Nickel Creek’s authenticity because of the influence of modern sounds on this album, an uncommon influence in a music prized for its age. Though This Side still featured members of Nickel Creek on their bluegrass instruments, they were using them in different ways, drawing from the contemporary music around them. From the very first track, Thile’s instrumental “Smoothie Song,” This Side challenges bluegrass authenticity with studio manipulation and new formal ideas. “Smoothie Song” features an electrically-manipulated bass and is constructed with repeated riffs, more like funk than bluegrass. The second track, "Spit on a Stranger," is a cover of the alternative rock group Pavement and steps even closer to the electric/acoustic barrier, featuring electrically-modified voices that sound more like the Beatles' harmonies than traditional bluegrass, and an prominent electric mandolin layer (6). Another track on the album, "Should Have Known Better" also pushed the limits with the inclusion of dissonant overdubbed string parts, jokingly described by Jeffery Rodgers as sounding as if the Kronos quartet knocked on the wrong studio door. Though Krauss produced This Side, one interview with the group suggests that Nickel Creek themselves conceived many of the innovations in the album (7). Besides manipulating elements, This Side illustrates how Nickel Creek rethinks bluegrass roles. In the absence of a banjo, Sean Watkins and Thile do not have to compete for sonic space, opening up new possibilities for the layering of textures. Watkins explains these new roles: “In bluegrass, the role of the guitar player is mainly for rhythm. But in this band, Chris has the dominant role rhythmically when he's not soloing. I can do more stuff with texture and focus more on chord voicings, things like that, while doing rhythm. We all have responsibilities, but because we know each other really well, we can switch roles easily.” Thile and Sean Watkins, instead of sticking to their instrument’s traditional bluegrass role, are free to experiment with switching roles. Although this new, complex method would make it difficult for other musicians to play with them, part of the goal of standardization, the group is more interested in creating new recorded music than jamming with other musicians. Watkins’ mention of chord voices also shows a desire to experiment with the texture of the sound, an experimentation method uncommon in bluegrass circles. Another important challenge to authenticity on This Side is the lyrical content. No songs refer to typical bluegrass country situations such as farming, the old South, etc. Instead subjects include modern situations such as touring as a band and high school crushes. The one exception, the traditional ballad “House Carpenter,” could fit into Tolkien fantasy as much as Appalachian living. Despite these innovations, This Side retains some important characteristics of bluegrass, features Nickel Creek did not abandon. “Smoothie Song” has an overwhelmingly an acoustic sound after the initial manipulated bass (and a more traditional bass part emerges later in the song). The melodic riffs would not appear out of place in most bluegrass songs. The song employs a traditional bluegrass solo formula, with each group member improvising a solo. Throughout the album, the fiddle, acoustic guitar, and mandolin are always present alongside the infrequent studio manipulation. This acoustic sound starts and ends most of the album tracks. Other tracks on the album, such as "Seven Wonders," fit neatly inside bluegrass repertoire. Interestingly, Nickel Creek stopped referring to themselves as a bluegrass band after This Side. When asked, Sara Watkins defined the band as "progressive acoustic" (8). Perhaps with this label, Watkins attempted to link the band to art-rock groups that also pushed the limits of genre with their experimentation. The choice to emphasize “acoustic” suggests an essential aspect of the group’s self-perception. Sean Watkins responded in the same interview, "We don't really call ourselves anything. We just try to mix the kinds of music we would like to listen to into what we do, which is based on bluegrass...we just want to make music that anybody can identify with” (9). A few years later, Chris Thile told another interviewer: "We're not a bluegrass band, but a band that incorporates bluegrass into our music" (10). In both these comments, Thile and Watkins refer to bluegrass music to define themselves but shy away from the category. Another possible reason is that Nickel Creek had already established themselves with bluegrass listeners and now wanted to reach out to a wider audience. This pattern is common in other country crossover acts from the late 90s, such as Faith Hill, Garth Brooks, and Shania Twain, who developed a country fan base first before reaching for mainstream audiences (11). Genre confusion continued with Nickel Creek’s third album, Why Should the Fire Die? (2005), which peaked at #17 on the Hot 200 and topped the bluegrass charts. The fact that the album was not considered for the country charts when its music videos were being played on CMT shows how confused people were about Nickel Creek’s genre. Why Should the Fire Die? is in some ways more progressive than This Side, while in other ways it looks further back. It includes songs like “Helena,” which builds from an acoustic beginning to an aggressive rock climax with electric instruments, and “Best of Luck,” which is full of rock energy and angst. It also includes, however, two four-part bluegrass instrumental songs, “Stumptown” and “Scotch and Chocolate,” though like “Smoothie Song,” these are structurally more complicated than traditional bluegrass. “Anthony” uses structure and “low-fi” recording techniques to explicitly reference “old-time” music, perhaps channeling the feel and comedy of O Brother, Where Art Thou? “Doubting Thomas,” an all-acoustic song about a man struggling to have faith, is perhaps a postmodern version of gospel music, a genre that has always been a part of bluegrass repertoire. The last track of the album, “Why Should the Fire Die?” features very traditional 3-part vocals with acoustic instruments. While exploring new ideas, Nickel Creek does not abandon the past. Why Should the Fire Die? also illustrates Nickel Creek’s trajectory toward writing more of their own music. Unlike the first two albums, in which outside writers collaborated with group members to write most songs, members of the group wrote most of Why Should the Fire Die? without collaborators (12). With the new emphasis on writing their own material, this album adopts an autobiographical singer-songwriter quality, less common in bluegrass and even country circles. Also with this album, their image has changed: gone is the young innocence of the first album. Themes are more adult and modern, many dealing with disillusionment and infidelity in relationships, perhaps a reflection of Thile’s marriage and subsequent divorce. Nor are these themes typical pop fare. The first track on the album, the previously noted “When in Rome,” is about disillusionment, specifically disillusionment about being mired in ineffective traditions. Chorus lyrics suggest making smoke signals to attract new people to a society, a dated and ineffective method that no one would understand today. The music of “When in Rome” also reflects the struggle between the old and new. The song introduction has an old-time, “low-fi” sound as in “Anthony,” before a sudden shift into higher-quality recording, as if to suggest, “that is what old music sounds like, and but this new music is superior.” The rest of the track is progressive. The harmony in the verses is minimalist, sticking to a g-minor chord with a bass drone and emphasizing instead rhythmic interest with multiple strumming instruments and a rock-like violin hook. The three-part vocals also extenuate and prolong dissonant chords. In another non-traditional move, in the recording Thile plays a bouzouki, a sort of bass mandolin originally from Greece but adopted by Irish musicians for Celtic music in the 1970s. Once again, however, “When in Rome” refuses to give up one aspects of bluegrass: the emphasis on acoustic instruments. Large sections of the song lack vocals, instead highlighting the group’s instrumental prowess. Also, despite the comparison to an electric rock group, the majority of the sounds in “When in Rome” are acoustic. Nickel Creek re-imagines electric sounds through an acoustic lens. Instead of toning down rock as other acoustic groups might do, Nickel Creek translates the sound. The fiddle takes the part that would be played on the lead guitar. Multiple rhythmically active acoustic instruments simulate the fullness of electric rhythm guitar. This rhythmic activity plus a deep bass drum also substitute for a large drum kit, another normal feature of electric rock. Nickel Creek’s ability to “acoustify” electric rock songs has become almost a game to them, and they frequently perform covers of well-known electrical songs on their live shows. Examples of these cover versions include Britney Spear’s “Toxic,” and the Beatles’ “Helter Skelter.” Thile’s later group, Punch Brothers, has continued this practice of re-imagining electric instruments with acoustic. Acoustic = honest = authentic? In a Time magazine article, Sean Watkins suggests the reason Nickel Creek is peddling an acoustic sound: “The thing about playing acoustic instruments is that if you want to express a more aggressive feeling, it tends to be a little more honest sounding” (13), In other words, by peeling off layers of electronic manipulation, Watkins believes that music can express more believable feelings, a desirable quality for many young people disillusioned by the artificially constructed media world around them. This aura of honesty has historically been a part of the image of country music. Early country music performer Hank Williams said: “You ask what makes our kind of music successful...It can be explained in one word: sincerity...for what [we are] singing is the hopes and prayers and dreams and experiences of what some call the ‘common people’” (14). Williams’ words still reflect the feelings of country music’s listeners fifty years later. Yet the authenticity of country music has been questioned recently, and not only of the contrived pop sound of 1990s Nashville. Aaron Fox argues that although country music (and I would add bluegrass) claims to be authentic, one cannot identify the community or people that the music claims to represent (15). Country and bluegrass’s nostalgic image refers more to conventions of true and false than a reflection of reality. Nickel Creek, however, goes even further than just adopting the bluegrass acoustic aesthetic—in an attempt to be even more honest, they also shrug off the falsely-constructed authenticity of “old-time.” Composing their own music adds to this feeling of honesty. These strategies have attracted younger fans interested in bluegrass music, “bridging the gap between older fans of acoustic music and the thousands of young people turning up at folk and jam festivals across the continent” (16). The success of This Side and Why Should the Fire Die? on the pop charts illustrates that their message, whether “honest acoustic” or not, appeals outside their original bluegrass base, also. While Thile’s hiatus project, the Punch Brothers, has continued on a similar creative trajectory as Nickel Creek, it has never been quite as popular. The same could be said about the various solo albums the members of Nickel Creek have produced. Somehow, the sum of their parts produced something greater. Nickel Creek revitalized the bluegrass genre while emphasizing vocal harmony and virtuoso playing of acoustic instruments. The group took the core bluegrass sound and infused it with modern sounds closer to the experience of urban youth. This revitalization is similar to how Bill Monroe and Earl Scruggs modernized hillbilly music, inventing the bluegrass genre seventy years ago. In that time, however, the dreams of the common people have changed. Production values and expectations have changed. New Grass Revival was an attempt for this update, and Nickel Creek revives the spirit of that revival. As Time magazine suggested, though perhaps prematurely: “to hear Nickel Creek is to hear the vibrant reinvention of a classic form” (17). Well, I think I’ve posted enough about Nickel Creek for a while, but I’ll probably get around to reviewing their new album A Dotted Line sometime soon. If you got all the way to the end of this post, go get yourself a cookie. You deserve it. (1) Stephanie P Ledgin, Homegrown Music: Discovering Bluegrass, with foreword by Ricky Scaggs (Westpoint, Connecticut: Praeger, 2004), 79. (3) "Hand Song" (Sean Watkins and Puckett) is an example of the country Time-Shift paradigm: When the chorus returns, its lyrics are re-interpreted according to the new time frame presented in each verse. See Jocelyn R. Neal, “Paradigms, Musical Signifiers, and Form as Function in Country Music,” Music Theory Spectrum 29 (Spring 2007): 69. (4) L. Mayne Smith, “An Introduction to Bluegrass,” in The Bluegrass Reader, Thomas Goldsmith, ed. (Urbana and Chicago: University of Illinois Press, 2004): 79. (6) Andy Ellis, “Nickel Creek’s Sean Watkins Gives Traditional Flatpicking a Progressive Twist,” Guitar Player 36 (December 2002): 58. (7) Jeffery Pepper Rodgers, “Up on Nickel Creek: How Three Bluegrass Prodigies Became One of the Freshest Successes in Pop Music,” Acoustic Guitar 13 (December 2002). (8) Deborah Evans Price, “Nickel Creek Shows a New “Side” on Sugar Hill,” Billboard: The International Newsweekly of Music, Video and Home Entertainment 114 (20 July 2002): 85. (10) Dennis Cook, “Chris Thile: Bringing in Some New Blood,” Jambase. (11) Keith Caulfield, “Taylor Swift Continues Remarkable Chart Run,” Billboard: The International Newsweekly of Music, Video and Home Entertainment 121 (10 January 2010): 41. (12) There are two exceptions: “Jealous of the Moon,” which was co-written by Chris Thile and Gary Louris, and a cover of Bob Dylan’s “Tomorrow is a Long Time.” Dylan, like Nickel Creek, was another modernizing influence in folk from an earlier generation. (14) Rufus Jarman, “Country Music Goes to Town,” in The Pop, Rock, and Soul Reader: Histories and Debates, ed. David Brackett (Oxford: University Press, 2005), 56–7. (15) Aaron Fox, “The Jukebox of History: Narratives of Loss and Desire in the Discourse of Country Music,” Popular Music 11 (January 1992): 53. (16) Matt Watroba, “Off the Beaten Track: Nickel Creek–“Why Should the Fire Die?” Sing Out! The Folk Song Magazine 50 (Spring 2006): 144.